IWASSA Co.: Network "LinkedIn" announces its acquisition of Service "Newsle" like Google alerts. 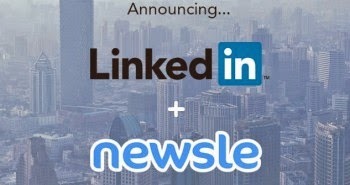 Network "LinkedIn" announces its acquisition of Service "Newsle" like Google alerts. Network LinkedIn announced the acquisition of service Newsle like Ptnabihatjocal as it allows you to import your contacts and friends lists from Facebook or LinkedIn and then search the web and send an alert if you mention anything about them. The service will be integrated with LinkedIn and its various products and will enable users to continue to use the existing service separately from LinkedIn. During the past three years has worked in the areas of Newsle language processing of live and machine learning algorithms in order to develop its technology and service that you search for articles that talk about anyone you want, and so notified within seconds of publication. Will be an important addition to Newsle LinkedIn in terms of strengthening relations between users within networks of acquaintances. The social network for business acquired last year on the application of reading content similar to the idea of ​​Pulse Filipord.